We were in the area one week too early to hike on the Cleman Mountain side. The entire area was closed for the protection of wintering elk and will reopen on May 1. We continued driving east on Wenas Road looking for options on the east side instead and came across one of the area’s green dot roads with an unlocked gate. I checked my desert hiking book against the maps and realized we were at the foot of Pine Canyon, just three canyons east of Black Canyon. Instead of hiking in the canyon, the pups and I got on the ridge just east of it for better views and open space. Views aren’t exactly spectacular when you’re stuck hiking in any of the area’s narrow canyons, so the ridge it was. We aimed for the highest point on the ridge to get a glimpse of The Enchantments and perhaps the City of Ellensburg. 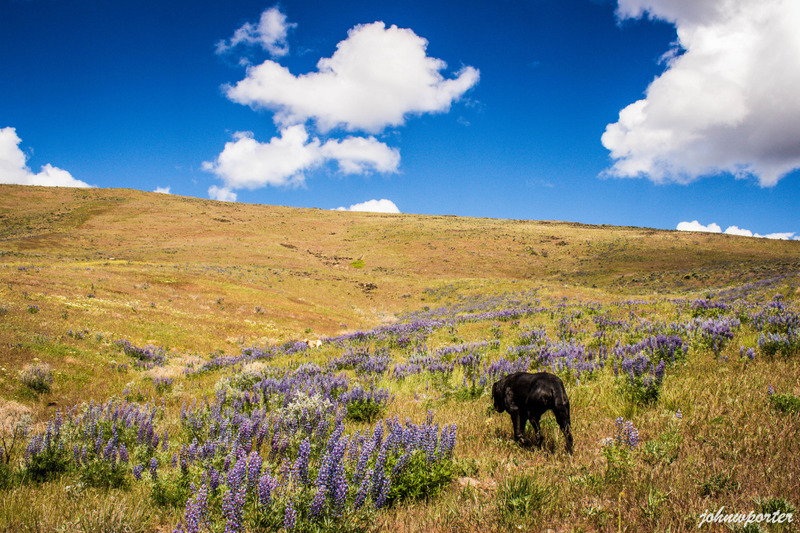 Lots of lupines and daisies at the lower part of the ridge, then they gradually thinned out and got replaced by rocks. Weather started off cloudy and windy, then the sun came out and brought along with it the wind. It got progressively windy the higher up we went, and became intolerable once we got to the viewpoint. We immediately dropped to the north side of the viewpoint to dodge the wind and to enjoy our lunch. Sadly,the relentless wind never died down for the entire duration of our stay. It looked cloudy and gloomy in the direction of The Enchantments, was only able to make out a few peaks. Cities of Ellensburg, Yakima, and Naches were in clear view so lots of photo ops with the dramatic clouds hanging low above. On the way down it got windier and colder, so I kept my puffy coat on all the way back to the car. Snow showed up around 6,000 feet and all the way to the summit. I put on snowshoes at 6,500 feet when the snow got a bit too punchy and slightly slushy, so glad I brought them too! South slope was a tad steep and icy so I stayed close to the south ridge from 7,000 feet on with my ice ax. Summit was not visible until around 7,900 feet where the ridge flattened and where there appeared to be a sketchy corniced cirque with the summit cliffs before us. The pup and I got around the sketchy spot by traversing around on the left, stayed close to the exposed rocks, and eventually connected with the gully leading to the summit. The gully felt steeper and it was icy in some places. I brought crampons but only used microspikes to finish the final scramble. What a gorgeous day! It was everything I had imagined it would look, but more snow than I had anticipated that’s for sure. The first I did after getting on the summit was to check out the two beautiful mountains the pup and I climbed last summer–Golden Horn and Tower Mountain. The mountains looked quite picturesque fully covered in snow. Other than the two, many others near and far like Black Peak, Silver Star Mountain, Mount Logan, Eldorado Peak, Mount Ballard, Azurite Peak, Glacier Peak, and Jack Mountain were all in clear views.